Len Kravitz, PhD earned his degree from Health Promotion and Exercise Science, University of New Mexico, May, 1994, and a M.A. in Physical Education from San Jose State University. Dr. Len is the Program Coordinator of Exercise Science and a Researcher at the University of New Mexico where he won the “Outstanding Teacher of the Year” award. Throughout the years Dr. Kravitz has been honored with a multitude of awards, including the 2009 Canadian Fitness Professional “Specialty Presenter of the Year” award, chosen as the ACE 2006 “Fitness Educator of the Year” and received the prestigious Canadian Fitness Professional “Lifetime Achievement Award” to name a few. 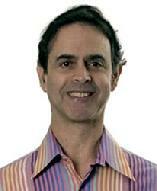 Dr. Len has been a key provider in research in a variety of exercise science fields, dating back to 1982 through today. While published in books, magazines, manuals and journals, Dr. Kravitz thoroughly enjoys educating eager learners through written materials as well as live education. He also enjoys his spending his time sitting on many different advisory boards for AEA, ACE, IDEA, American College of Sports Medicine Health & Fitness Journal, Southwest American College of Sports Medicine, Canadian Association of Fitness Professionals, Journal of Exercise Physiology, and Journal of Strength and Conditioning Research.